Below, you’ll find the full press release from the BBG regarding Andy Lack’s appointment. At the end of the press release I’ve noted another article from the NY Times. 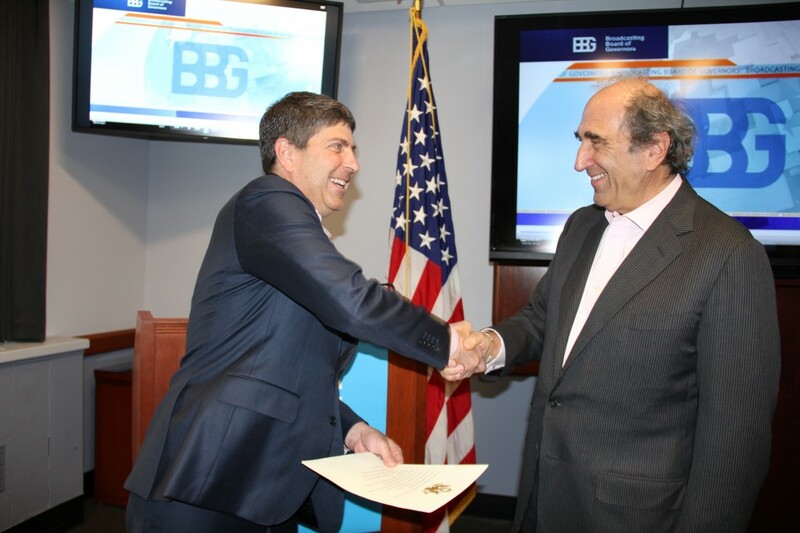 WASHINGTON – Respected journalist and media executive Andrew Lack was sworn-in today as the Chief Executive Officer and Director of the Broadcasting Board of Governors, the federal agency that oversees the five networks and broadcasting operations of U.S. international media. Those networks include the Voice of America, Radio Free Europe/Radio Liberty, Radio and TV Martí, Radio Free Asia, and the Middle East Broadcasting Networks. Lack is the first-ever CEO of U.S. international media. Creating the position of a CEO has been a key objective of the agency’s governing board and the Administration. Lack’s selection follows an almost year-long search process that began in October 2013. Prior to being selected by the BBG, Lack served as the Chairman of the Bloomberg Media Group. He joined Bloomberg in October 2008 as CEO of its Global Media Group and was responsible for expanding television, radio, magazine, conference and digital businesses. Previous to joining Bloomberg, Lack was Chairman and CEO of Sony Music Entertainment, where he led the company’s roster of prominent international artists and vast catalog of recorded music from around the world. Before joining Sony Music Entertainment, he was president and chief operating officer of NBC, where he oversaw entertainment, news (including MSNBC and CNBC), NBC stations, sales and broadcast and network operations. He was responsible for expanding the Today show to three hours and creating the show’s street-side studio in New York’s Rockefeller Center. From 1993 to 2001, Lack was president of NBC News, which he transformed into America’s most-watched news organization through NBC Nightly News, Meet the Press, Today and Dateline NBC. Before going to NBC, Lack spent much of his television career at CBS News. After joining in 1976, within a year, he became a prominent producer for 60 Minutes and subsequently, senior executive producer of CBS Reports. Lack’s broadcasts at CBS earned numerous honors, including 16 Emmy Awards and 4 Alfred I. DuPont-Columbia University Journalism Awards. Before Mr. Lack’s appointment, day-to-day international broadcasting operations were overseen by a board that had become known more for its dysfunction than for managing broadcast programs that reach more than 200 million people every week. Now, with Mr. Lack at the helm, the feeling in the agency and in Congress is that the broadcasting board is better positioned to counter the increasing hostile and suspicious views of Americans aboard, and more forcefully engage international rivals such as China and Russia in the high-stakes information war. Indeed, “immense challenges” may even be an understatement. Bon courage to you, Mr. Lack! Let’s certainly hope for the best. This entry was posted in Broadcasters, International Broadcasting, News, Shortwave Radio and tagged Andrew Lack, BBG, Broadcasting Board of Governors, Ted Lipien on January 23, 2015 by Thomas. Let’s hope he’s a shortwave radio enthusiast.